If the occasion warrants a bit of expenditure you'll want to find a certified caterer to help you with your menu and planning. Allow the caterer to make suggestions along their area of expertise. It's best to avoid forcing a caterer to serve particular foods they're not comfortable executing. Find a caterer where you're confident in their competence and allow them to stay within their comfort zone. Depending on your location, certifications for catering are regulated. 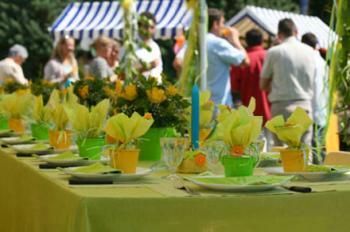 You'll also want to confirm the caterer has valid insurance for the safety of yourself, your caterer and your guests. If cost savings are the key you'll need to create the menu yourself. To save a dollar, stick with locally grown produce, simple creations, and low cost cuts of meat. Avoid the more expensive items such as boneless skinless chicken, and more expensive cuts of meat. Catering menu ideas must fit the event you are planning. The layout and offering of food for buffets, theme dinners, business meetings and award dinners will differ slightly. Focus on what you're trying to achieve, the mood, and how relaxed you want the serving to be; buffets are perfect to reduce man hours, whereas a full serve system suits a black tie event. Take note of the season and offer holiday appropriate dishes. Try to have a variety for all guests, especially vegan selections. Ensure your guests have RSVP'd so you can plan around attendance. Food is expensive, waste not want not! Plan for having a small percentage of additional guests (surprise visitors). If staff is on hand, plan to accomodate if they're working long hours. Most importantly, don't run out of food (it's embarasssing and can put a damper on a good time for some guests). Most importantly, menu selection comes together well when well planned. Be creative, offer selection and focus on your guests. If on a tight budget, be resourceful; the amount of money spent is not intrinsically tied to the quality or taste of food. Taste test well in advance and have fun planning a surefire hit of an event!